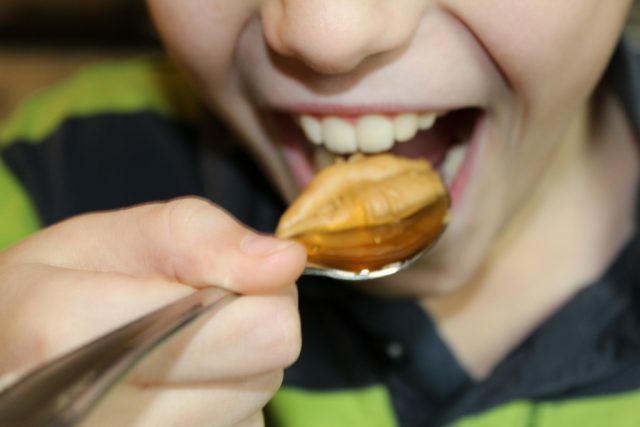 Confession: My son caught me crouching in the pantry with a large spoonful of peanut butter and honey halfway to my mouth. The spoon made it the rest of the way, hastily. Regan, I said firmly, I am gathering shthrength to care for my children. Now go play. Three weeks of intense coughing by Mrs. Zook developed into 100% of her kiddos sick, including foster-baby-for-at-least-the-weekend who turned into foster-baby-for-at-least-two-weeks and then began upchucking violently. The washing machine stopped working and several inches of water pooled in the basement from all the rain. My mother got her first chemo treatment and my sister arrived from Israel, but I stayed away for the sake of all those germs. A great weight loss program, all told; I highly recommend it. There is so little time to actually eat. That is why I was crouching in the pantry fortifying myself with a chunk of peanut butter. I figured it was better than eating the entire bag of York mints. And it was within reach, too. But things are looking up. My man hotwired the washing machine and drained the basement. My friends sent food and comforting text messages, despite sickness in their own troops. I made it to the doctor, and the baby stopped puking (and oh, she is sweet), and the coughing bug caught the final child. We are fresh out of children for this bug to catch. Unless it starts catching them over again, which—heaven forbid. 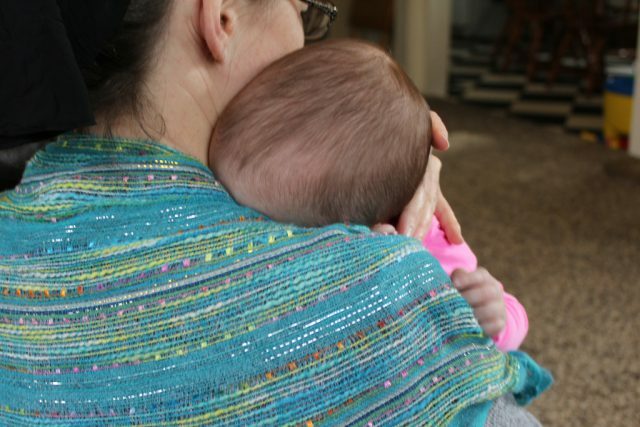 My friend Anita owned the one piece of clothing in the world that I coveted, a webbed scarf knitted in a dragon’s wing pattern, deep turquoise with flecks of all colors woven through it. Her mother made it for her; not the kind of thing you can go buy at Walmart. The week after Christmas I got a surprise package from my friend Heidi in Canada. 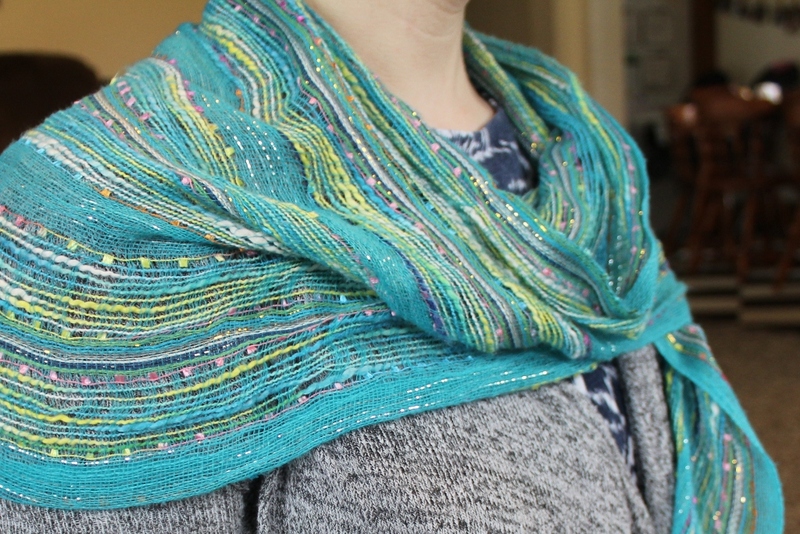 I unwrapped a beautiful light turquoise store-bought scarf with flecks of color all through it. Hey, my son said. That looks kind of like the dragon’s wing. I laughed in delight, and wrapped it around my shoulders. I wore it in season and out of season, matching and not matching, shelter me in the shadow of your wing. His provision is not a sparrow’s wing, as I always imagined, but something akin to a dragon’s wing. I wore it on the night the baby came and on the nights I sat up with her and I wrapped it around everyone I rocked to sleep. I think He sent it on purpose, right before my crazy time. I wore it till I could feel it around me whether I was wearing it or not. I’m wearing it now. I debated and debated about the color, Heidi said. I thought you liked blue. 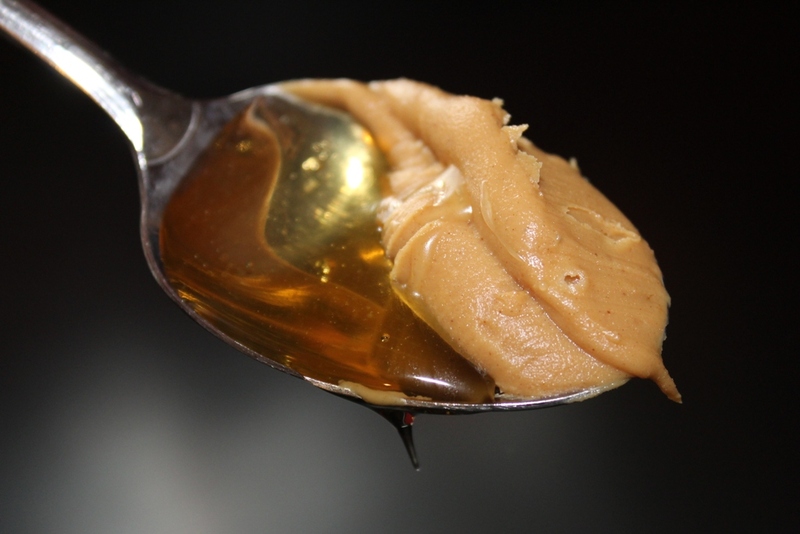 I had to fill another spoonful of peanut butter and honey for the sake of a photograph, but I didn’t mind. Neither did Regan, who stayed home sick today from school. He got to eat this one. I have a similar scarf but in black and various colors for which I share your sentiments. Sometimes I even wear it for a covering. I love how God sends bright blessings in the middle of rough patches….. I pray everyday for your mother……she has impacted my life so profoundly….. Thank you, Sherri! I will pass that on to mom. I’m feeling the sheltering vicariously. This is so beautiful! And so is that scarf! Oh, I am so sorry. Nothing is so demoralizing to a mom than sick children. So glad that God brought you a reminder of His presence just when you needed it. Shari, I am so sorry. . .I had no idea you all were fighting the bug. May there be full recovery and your bodies shielded from the return of the “dragon bug.” He does cover us with His wings and the scarf is a true reminder of that! So glad to hear that things are looking up for you!!! I love your new scarf! It will help fortify you in any eventuality. Hopefully all the crazies are gone for good. I’m so sorry to hear that you were all caught by the same bug that caught all of the family on the East side of PA…I heard enough of these stories to pray that this bug never comes back again!! I and Daddy also got our share of it!!! UGH! !Very ready for spring, and BTW, I’m so glad that you gave Regan a spoonful!! Can you believe I can remember those kinds of spoonfuls myself! Love you! 🙂 Did you really? That gives me a fresh dose of courage. I think you were a very good mom. Aw, this is so gorgeously beautiful– the scarf, the wing Jesus sent you! Love it! Last year during our trial by fire with a toddler and a baby through foster care (and our 6 year old and 2 year old and halfway to baby #3), I found the CD Acappella by LordSong. I played their version of “Under His Wings” over and over and over for months. I love your image of His wings–celestial blue, shot through with gold and silver and colors.